You have your CFA study plan. You are doing your best to execute it. You study systematically. But after a couple of days you seem to no longer remember what you studied... I hope you know it doesn’t have to be this way! The solution is really simple – though it takes some TIME & EFFORT. Are you notorious for forgetting what you studied? Get to know your enemy and how to defeat it! There are 3 lacks CFA candidates usually experience during their exam prep: lack of CONTROL, lack of MOTIVATION, and lack of KNOWLEDGE RETENTION. We’ve already covered the first 2 issues in previous posts. Today, we talk about how to minimize forgetting and maximize learning while studying. To begin with – for the purposes of this post – we need to state the difference between STUDY & LEARN. While study focuses on the action alone, learn already appreciates its effects. What it means is that not all who study – learn... At least, not with the same satisfying effect. I’m sure you want to study so as to learn effectively. I’d like to tell you how you can do that. Our memory has its limits. It can’t & won’t store everything. This distinctive characteristic of the human brain is about the economy of its functioning. We are bombarded daily with tons of info. It would be exhausting to remember each and every detail of our lives: what we saw, what we heard, what we read... That’s why our memory filters all the information and retains only those it finds worth remembering. The retention of information decreases with time. 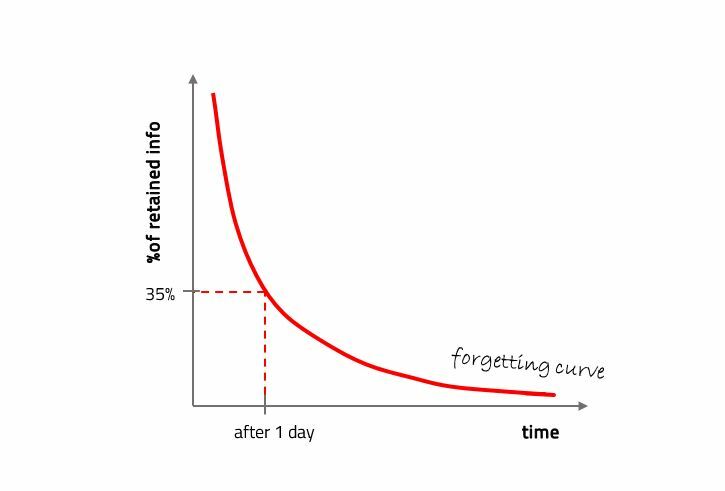 How deep your forgetting curve is depends on the attention you pay to the specific information or the strength of your memory as such. 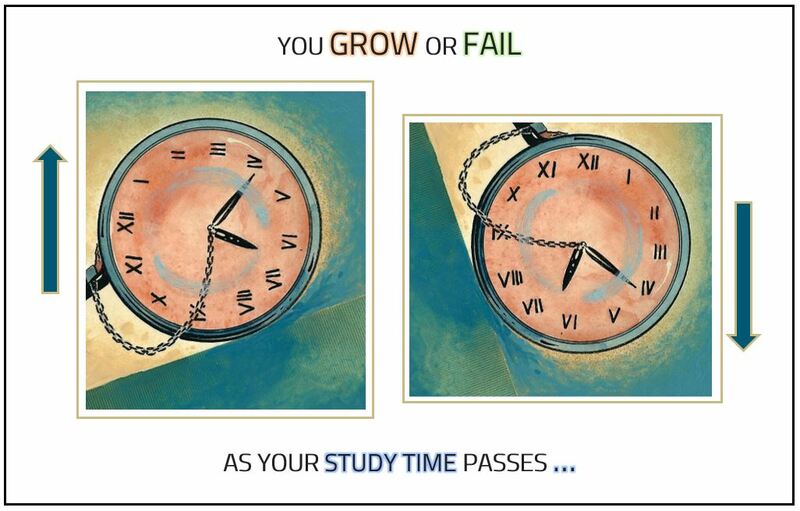 Sadly – though – you will forget even up to 65% of what you study today by tomorrow’s evening. 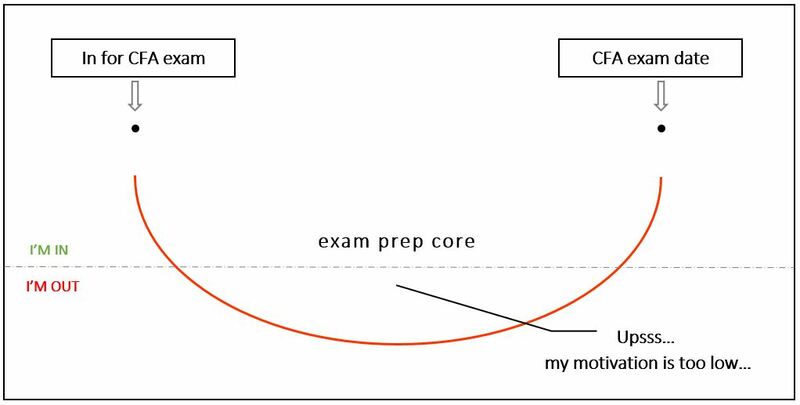 Surely, you need to do something about it if you want to have a successful exam prep. You need to retain your study material much better than just 35% of it (or even less over time). To this end you must adopt the right attitude towards studying and enhance your learning style! This should be your motto! How can you do that? The first step is to develop your study routine and find the motivation to persist in studying. For this, adopting the right strategy will be hugely helpful. For example – as part of your study strategy – you may want to set your study sessions to concrete days and hours and Have at least an hourly study session – then mark your CFA reading as done or partially done. 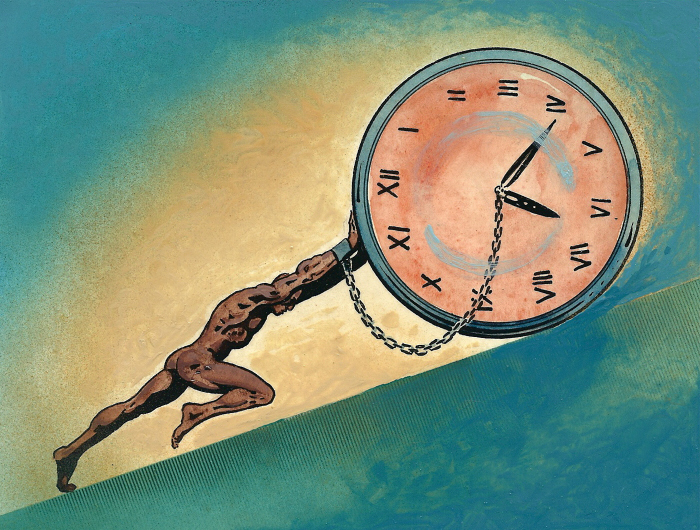 If you’re using Motivation PLAN – you’ll see your estimated current week time change in your favor. If you’re using Knowledge Retention PLAN – you’ll also see the topic progress bar grow as you watch videos, do tests, and memorize formulas .reward yourself every time you stick to your plan. That brings us to the second key element of enhancing your study skills, namely In your Study PLAN, always sum up your study week on Sunday – to see your progress & react if necessary. After you summarize, you can also edit your weekly study schedule – whether it’s to add some CFA readings or to postpone them by temporarily removing them.consistent self-assessment. While it’s only natural to err when building your study routine, you need to stay observant and constantly improve your study process. Because only when you understand what keeps you back, can you move forward! Finally, let’s not forget about some obvious study rules all CFA candidates should always follow but often fail to. regularly revise what you study. I know you know it! But it’s only when someone tells us something that we often realize we already knew it and we should really do it . The retention of information increases with revision. 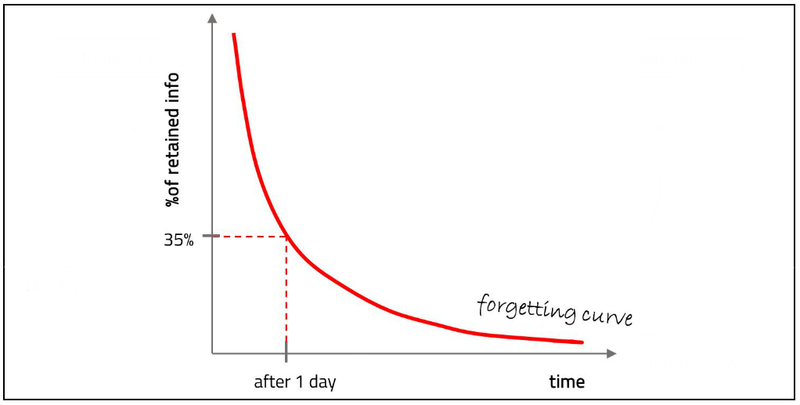 If you do nothing about your forgetting curve – you fail to respect your study time and let like half of it simply be gone with the wind. You can’t let your study time evaporate just like that! You need to condense your CFA curriculum readings into the essential pieces of information and revise them time after time to make sure they stay in. Do not worry about overlearning! Ebbinghaus defines such a thing (it’s when you practice something a bit more than would do to memorize it) but says it’s not dangerous . To the contrary – it shallows your forgetting curve significantly and ensures more successful knowledge retention. As we said: millions of times a day our brains need to decide what’s worth remembering and what’s redundant. By reviewing and practicing the chosen bits of CFA curriculum – you imply they’re important. That is how they get transferred from your short-term to your long-term memory and safely – in your brain – to the testing room on your exam day! It’s not the aptitude most CFA candidates lack – it’s the attitude. I have no doubts you can understand all that’s required to pass your CFA exam. But can you LEARN it? Will you retain it and be able to recall it when you’re asked about it in your exam? With the right attitude adopted now to your prep – the answer is most likely a YES. And that is exactly why – apart from studying – you also need to review. 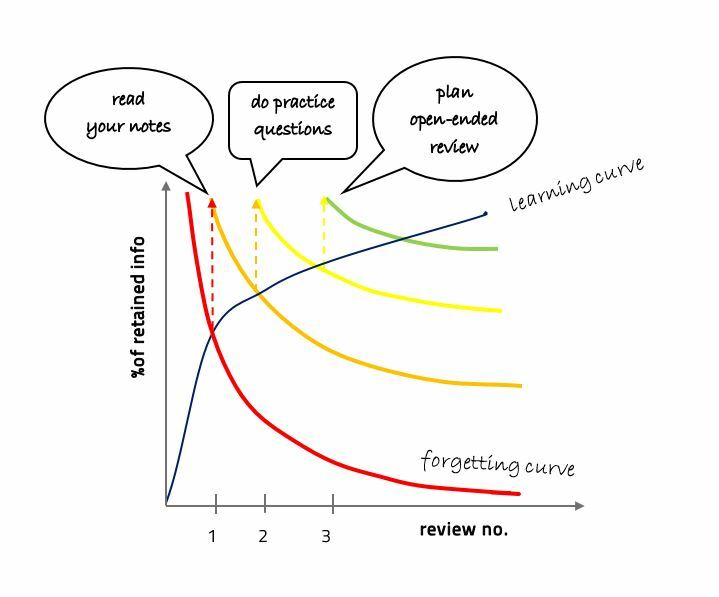 To ensure you’re having a productive study process where resisting your forgetting curve (while enhancing your learning curve) becomes a habit. Because developing the right learning habit is far more important than applying even the most effective study tips. Habit is something repetitive, something ingrained, something automatic. You should apply the most effective study tips that work for you, but they will never truly resonate until you habitualize them. (with all the review tools & apps available inside your study plan). By applying your proper review system, which is more than just topic and final revision, you will be able to develop the habit of effective learning . The idea behind these systematic review sessions is to improve your study process by making your studying more productive. You can finally take full responsibility for your CFA exam prep and prepare like you are aware of how great a challenge the CFA exam really is. Your Knowledge Retention PLAN – i.e. your CFA study plan with all its features & functions, including control & motivation – helps you turn your study time into the quality performance you need and deserve. Surely, you remember how we talked about Fixers and Growers in our first post (or is your forgetting curve messing with your memory right now...?). The drive for development and improvement (despite all the obstacles) is the realm of the Growers. They just have it. They are determined, committed, and can take constructive actions – which eventually produces the results they are waiting for. The Growers believe that the character can be built. That is why they can develop new good habits more easily. The way they see it – it’s just some job they need to do to make a real change in their lives. The Growers show us everything’s possible. It’s not that there are no natural talents among the Growers. There are. But together with a brainiac – side by side – there’s also a hard worker in them. Never think you won’t pass your CFA exam. Also, never think you’ll surely pass your CFA exam. While strong faith in your abilities is part of your success, so is full effort. Without full effort, you’re unlikely to achieve. How can you become a hard worker even if you do not naturally have it? First of all, do not constrict your growth. Make yourself truly believe success is meant for you. Then, to make your belief come true – always apply effort (even you, Fixer ). Try hard despite difficulties. Persist in the face of troubles. Never give up. Such an approach can make you grow in life, not just in your exam prep. 3. your lack of knowledge retention. learns (not just studies) owing to the proper review system and review tools and apps available inside your study plan. 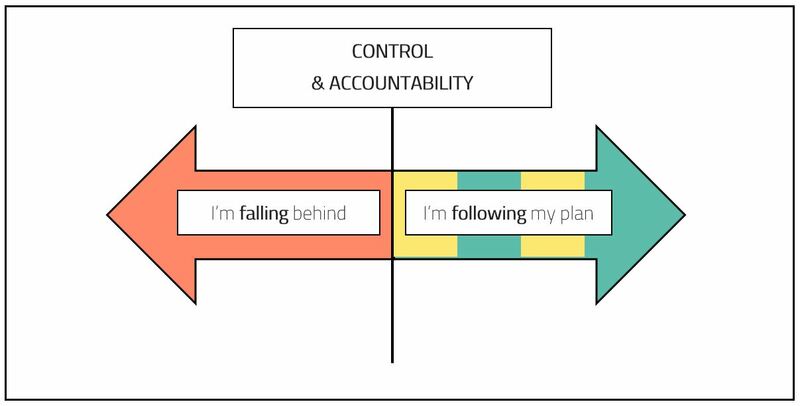 This is how – for your CFA exam prep – you gain your quality performance based on (1) control, (2) motivation, and (3) knowledge retention. GET QUALITY EXAM PREP: CONTROL, EXECUTE, LEARN! They seem to have what’s necessary for aware studying guided by self-control, driven by internal motivation, and aimed at effective learning that brings the desired results. But if the Growers have it – so can the Fixers or the Mixers (i.e. those who find it difficult to define themselves either as a Fixer or as a Grower). They just need some more incentive from the outside to awake their potential (because we all have the potential to grow). Your CFA study plan is full of such incentives! SEE YOUR STUDY PLAN WORK! get +40 hrs videos + tests + formulas, etc. It may be your first CFA exam. You may not be fully aware yet of what a great deal of effort your exam preparation will take. But if it’s not – you already know... And if you also happen to know what it means to fail (which I hope you don’t! ), perhaps you were wondering at times why you failed while others passed even though you studied real hard – just like the others. The answer may be all about the mindset. Maybe the others were more GROWTH-oriented towards their exam prep. Meaning: all throughout, they stayed in charge of their exam prep, they maintained their motivation, and studied more efficiently than you. A GROWTH mindset is good. It leads us toward reaching our goals. The goal you are striving for right now is Your Passed CFA Exam. With your heart set on it – make sure you can achieve it!